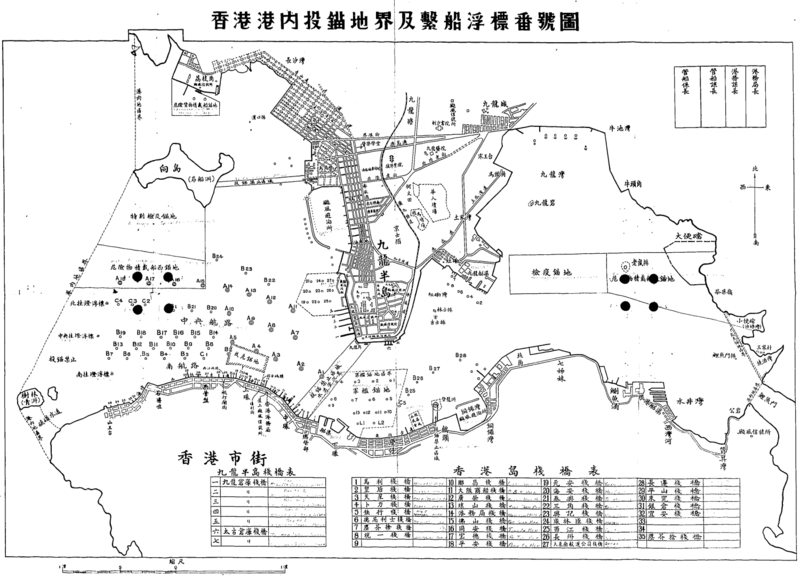 Kwong Chi Man has kindly translated the Japanese names of the piers shown in columns at the bottom of this map of Hong Kong harbour which was drawn during the occupation, WW2. Elizabeth Ride has kindly transcribed the faint handwritten English ‘translation’ alongside the Japanese. Many thanks to both contributors. KCM: This map of the Japanese Harbour Authority (under the IJN) was stolen by BAAG agent, Mr. Yan Cheuk Ming who worked inside the Harbour Authority and was executed as a spy in 1943. ER’s transcription has been added in square brackets where there is a discrepancy between the Japanese translation and the English version. KCM: 1-34 is a list of piers of Hong Kong Island (with very faint English names next to it). This is the translated list (27, 28, 31, 32 might be wrong/require further research). 7. “Garbage Disposal Pier” (塵芥 = garbage in Japanese; the full term 塵芥捨 means garbage disposal).